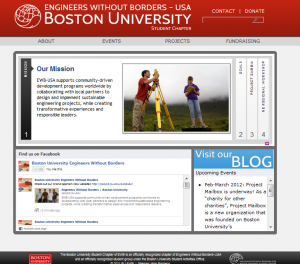 You are currently browsing the Engineers Without Borders at Boston University blog archives for February, 2012. 5… 4… 3… 2… 1… We’re Live! Check out our new website for the EWB-BU Student Chapter! It’s got the most recent information on our events and projects, such as our work with CGHD (Center for Global Health and Development) and the Zambia Center for Applied Health Research and Development (ZCAHRD) in addition to details about our upcoming Marshmallow Challenge for E-Week! On our new website, you can get updates from our Facebook page, this blog, among many other things. We’ve also set up a donation link! Looking to get involved with EWB-BU? Look into our Contact Information and shoot us an e-mail! We’ll be looking to add to the site a lot more in the future, so be sure to give us your feedback! 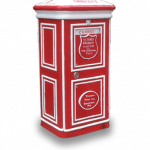 Our brand new website, courtesy of our Webmaster Alan Pacheco, can be used in the future, with our Facebook page and our blog, to get information about our group. Be sure to stop by! This year, the Boston University chapter of EWB has teamed up with ENG GOV 2015 to bring you the Marshmellow Challenge! 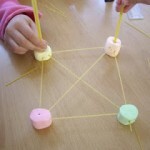 The objective is the make the tallest tower using just spaghetti noodles, tape, and a marshmellow. E-week is a tradition that was brought about in 1951 by the National Society of Professional Engineers to highlight the important contributions engineers make to society. This year’s E-Week, which runs from Tuesday, February 21st to Friday, March 2nd, features a host of excitingevents such as the Egg Drop Contest, the K’Nex Roller Coaster Design Contest, a Wii Tournament, and the Marshmellow Challenge! We’ll also be accepting orders for our new EWB T-shirts! Come by and place an order and drop by for some engineering fun! 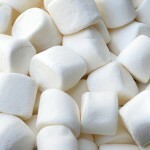 The Marshmellow Challenge is on Thursday, February 23rd at 5 pm – 6:30 pm in CAS B14. We’re looking forward to seeing you all there!